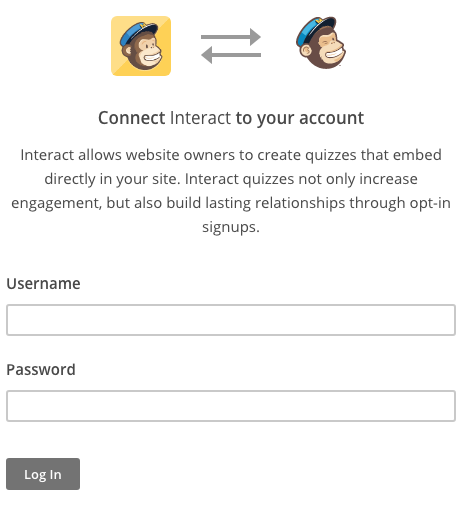 This article will describe how to connect your MailChimp account to Interact apps. Step 1: In the Interact app builder, under Connect your email list, choose MailChimp from the list of integrations. Step 2: You will be prompted to authorize the Interact app to access your MailChimp data. Enter your MailChimp credentials and click Log In to complete authorization. Add to List **Required**: Choose a MailChimp list from the dropdown to add new contacts to a specific MailChimp list. Example: For a quiz result trigger, you could connect different results to different contact lists to send autoresponders specific to the quiz result your customers received. Update Merge Field: Choose a MailChimp merge field from the dropdown to update the contact field for new contacts with a specific value. The value will auto-populate with the trigger name, but you can customize this with any value you want. Example: For a quiz result trigger, you could choose the MailChimp merge field "Quiz Result Title" from the dropdown and populate the field with the quiz result title for your quiz. Add Tag to Contact: Choose an existing MailChimp tag from the dropdown to add to the new contact. If the contact already exists, the tags will be added to the existing contact. Note: Contacts can only be added to a contact, not removed. Step 1: Here you will find an overview of the way your opt-in form fields are connected to MailChimp contact fields. Default fields (cannot be changed): Email. Step 2: For all other fields, choose one merge field from the dropdown that you would like to populate with the form value. Example: mapping Company Name to "Custom Field 1" will populate the value inputted for Company Name into the MailChimp merge field "Custom Field 1". Step 1: You will have the option to disabled double opt-in for your opt-in form. By default MailChimp requires subscribers to confirm their intent to subscribe. Check the box to skip this requirement. Will existing MailChimp contacts be updated? Yes, existing MailChimp contacts will be updated with updated field values and be added to new lists. MailChimp tags will be added to the existing contact. How do you create new MailChimp merge fields? Step 1: In your MailChimp account, navigate to your Lists and click on the list where you would like to edit merge fields. Step 2: Navigate to Settings -> List fields and *|MERGE|* tags. Step 3: Click the button labelled Add A Field at the bottom of the page. Step 4: Choose the field type to be Text. Step 5: Fill out the form fields as desired, and be sure that the Visible? checkbox is turned ON. What will a new contact look like in MailChimp? I am receiving an error when testing the integration connection with a test lead in the Interact builder, what can I do to fix this? Contact was permanently deleted from list: If a contact was previously permanently deleted or unsubscribed from your list, it cannot be re-subscribed via the API. Be sure to test with an email that has never been added to your list or use a variation of an existing email (ex. demo+test@tryinteract.com). Missing required fields: Be sure that your MailChimp list does not have any required contact fields that are not being sent by the Interact form. For example, if your MailChimp list requires a First Name field, but you are not sending first name data in your Interact opt-in form, the lead will fail to be added to your MailChimp list.